Though my blogging, I sometimes get invited to some special open days and it was a lovely surprise to be invited up to Nottinghamshire to visit the place that really ignited the winter opening of gardens for snowdrops, Hodsock priory. They have been opening for snowdrops here since 1991 and currently welcomes over 20,000 people to enjoy the 4 million snowdrops on this privately owned 800 acre family estate. It has been in the safe keeping of the Buchanan family for over 200yrs, with Sir Andrew Buchanan handing the management reigns over to George Buchanan in 2006. The snowdrops themselves grow in two main areas of the estate namely the garden that is 5 acres and the 12 acre Horsepasture Wood. The great warming fire! I think every garden should have one! Over the past years they have moved the snowdrops from the fringe areas of the woodland into the middle areas where they can be enjoyed. This superb setting if the back drop for an outdoor theatre group, The Whispering wood Folk preforming the Snowdrop Queen over the 16th-18th of February. The walk though to the main garden area from Horsepasture Wood is a walk of pleasure as you are flanked by sweet smelling Winter Honeysuckle Lonicera fragrantissima. The main gardens are set in about 5 acres of land surrounding the main house, the use of water has been cleverly done so it reflects views of the house and garden. On your way into the main garden you follow this delightful stream, flanked with winter colour, provided by of course snowdrops, dogwoods and Salix all playing a part too. The scent of winter catches you as you wander around the gardens with Sarcococca and Hamamelis providing the overtures. The garden is home to lots of other spring flowering plants like Iris reticulata, winter aconites, cyclamen, crocus and of course the Snowdrops! They have over 17 different forms of snowdrops in the garden including Lady Beatrix Stanley who happened to be Sir Andrews grandmother! 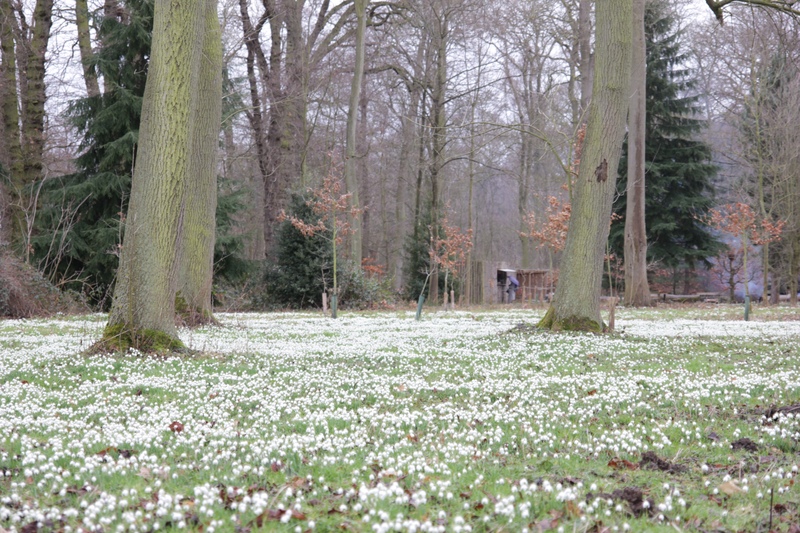 There’s also a huge fan of snowdrops in the main lawn, that sadly wasn’t out fully but will look amazing when it is! The gardens themselves are indeed full of little horticultural gems and the whole garden is a delight! It’s surprising to hear the main gardens and Horsepasture Wood are managed with just 6 part time workers including Sir Andrew and Lady Belinda. George did say this may change this year as 4 of them maybe retiring. The gardens are a true delight of Nottinghamshire, they have a real family feel about them and it’s clear Sir Andrew and George Buchanan care deeply about the estate and its long term survival, long term plans include extending the woodland, producing cricket bat willow for production of cricket bats and expanding the wedding venue experience. This family pride really shines though on the estate and for me the 31/2hr journey seemed well worth it to see somewhere so special. Hodsock priory is open for the snowdrops every day 10am-4pm until the 4th of March with the Whispering Woodfolk preforming this 16th-18th of February. There is also a couple of excellent eating points, the large heated marquee that produces rather excellent bacon rolls and another watery in the woods near the wood fire. Adults cost £5.00 and Children £1. Theres a £2.50 surcharge for the evening performance of the Snowdrop Queen. Is that our silk tassel you have there?! When I was in Saint Andrews Abbey, it was nothing like that! It is on the edge of the Mojave Desert in norther Los Angeles County. The bare landscape is captivating! The gardens were interesting too, but are not lush and landscaped. There are many pear trees and a few apple trees. Beyond that, there are Joshua trees and junipers, and a whole lot of open space with no shade. Didn’t you see it when you got the picture?